Y'all know how crazy I am about Harry Potter... Well now's the time to learn how crazy I am about The Simpsons too. I discovered this cartoon when I was 15 or 16 and I used to hate it because I didn't understand its use. Little by little, I watched an episode and then another one and I fell deeply in love with this show ; for years I missed no episode and saw each about three or four times. Now that I work, I have less time to keep watching every episode released but I'm still a big fan. 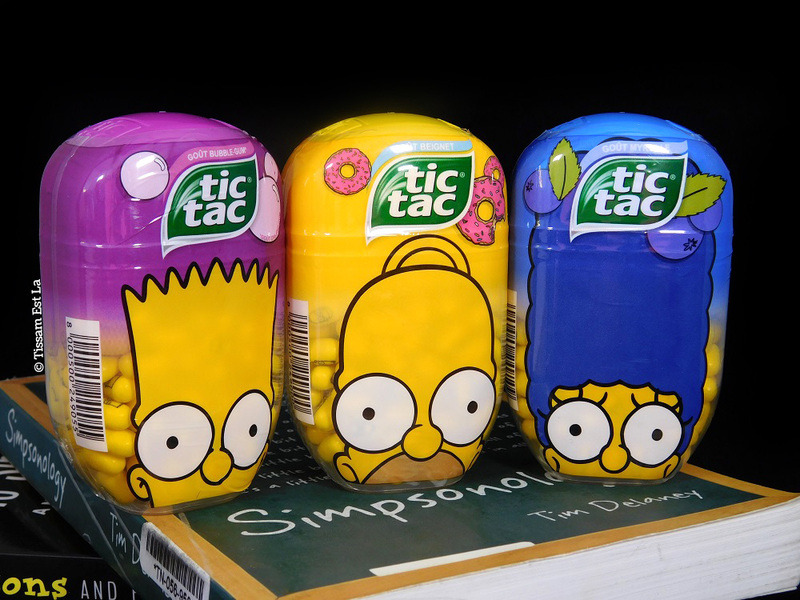 Also, I'm a big spin-off products fan so when I saw three small Tic Tac boxes with three Simpsons characters on them... I was sooo excited. This Tic Tac edition is limited till February I think and it's going pretty fast ! I found it in the Saint-Quentin en Yvelines Carrefour ; they were all reduced price so I also took one of each for my little sis' who's as big a fan as I am. There are three box sizes : the usual rectangular, 37-candies box, a 100-candies box and a big 200-candies box that is the one I got. Three flavors have been released : Donut for Homer, Blueberry for Marge and Bubble Gum for Bart. 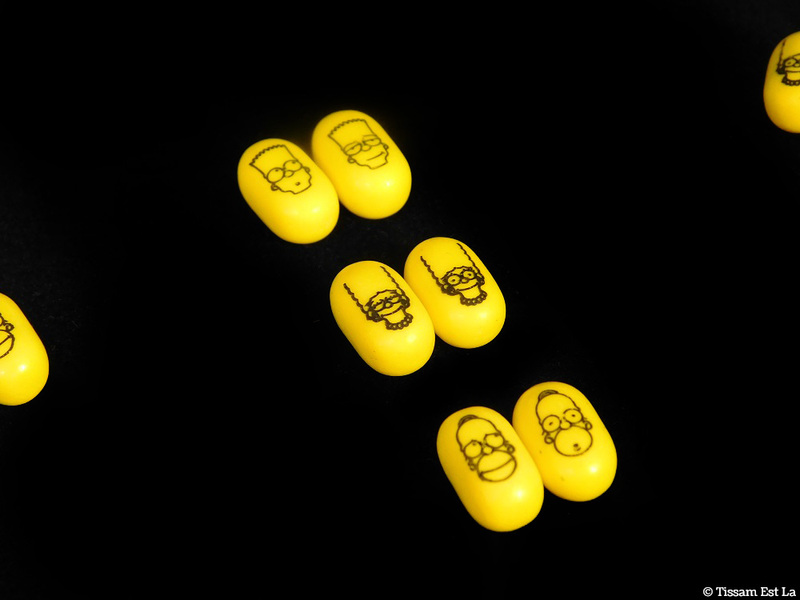 I love how adorable the printed faces of the Simpsons look on the candies, with two different face expressions according to the Tic Tacs. 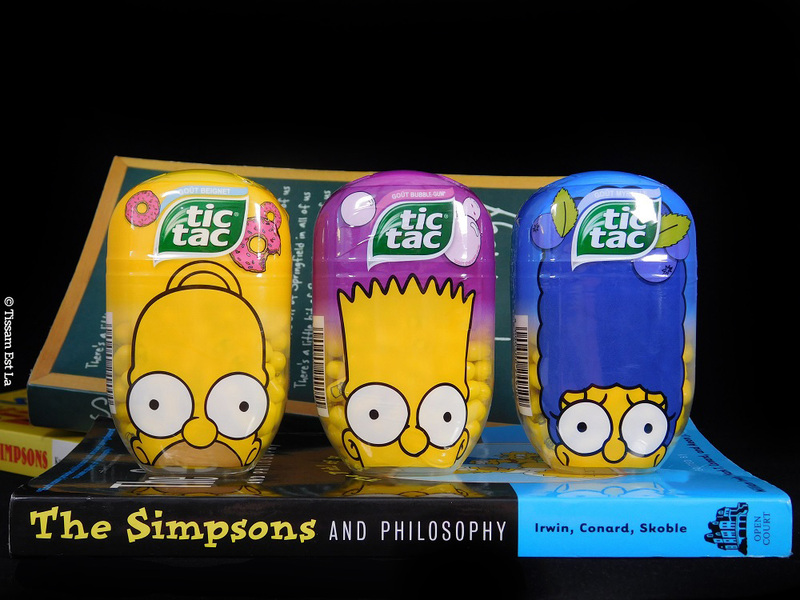 I loved the donut-flavored candies that really reminded me of a donut but I left Bart and Marge aside because once their Blueberry and Bubble Gum flavor are gone, they leave a weird freshness-made-in-Tic-Tac taste. 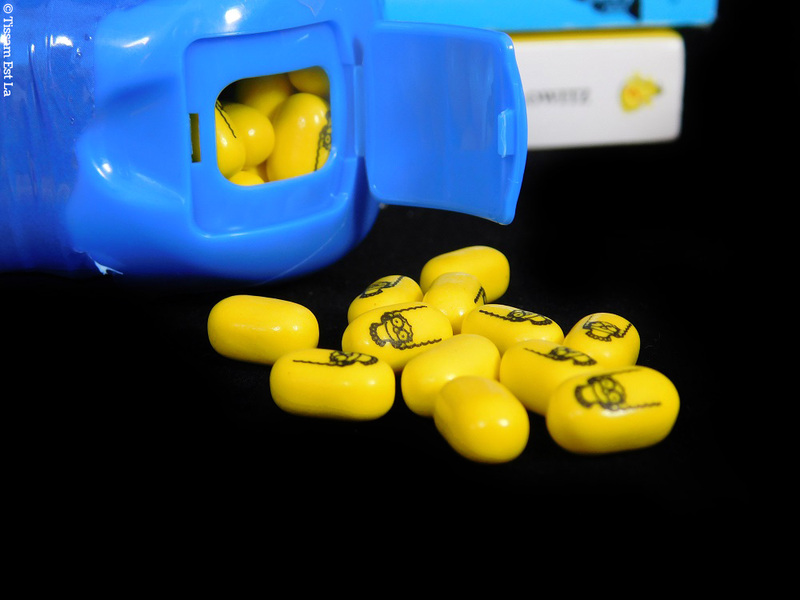 When are we going to get Harry Potter Tic Tacs, now ? 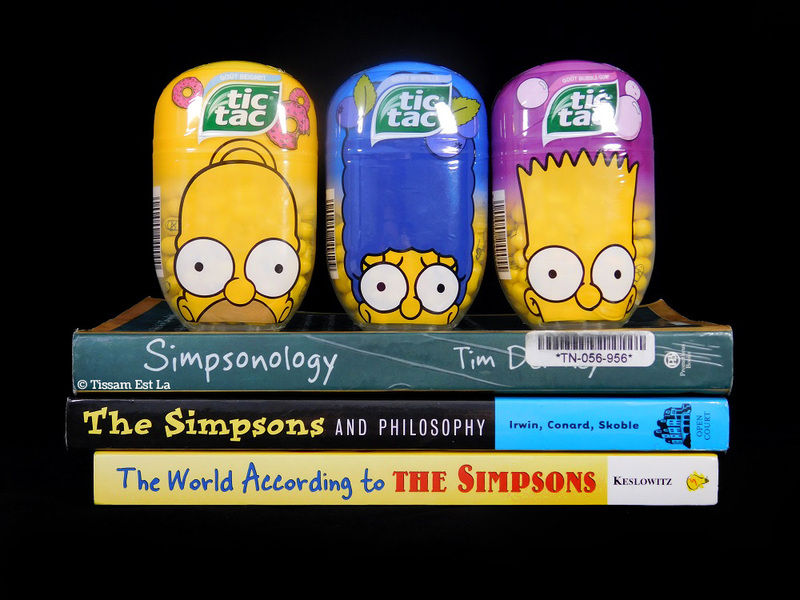 Have you tasted this version of the Tic Tacs made in Springfield ? What did you think ? Cette édition de Tic Tac est limitée jusqu'à fin Février il me semble, et elle part vite ! Je l'ai trouvée dans le Carrefour de Saint-Quentin en Yvelines (78) ; les trois boîtes étaient à prix réduit et j'en ai profité pour en prendre également une de chaque pour ma petite soeur, aussi mordue des Simpsons que moi. 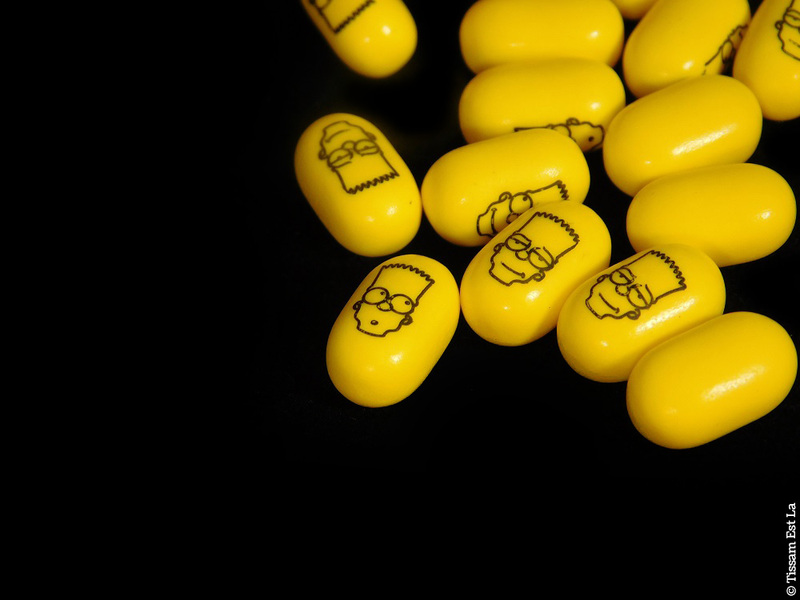 Les Tic Tac Les Simpsons existent en trois formats ; le format boîte rectangulaire habituel avec 37 pastilles, un format 100 pastilles et un gros format de 200 bonbons que j'ai réussi à trouver. 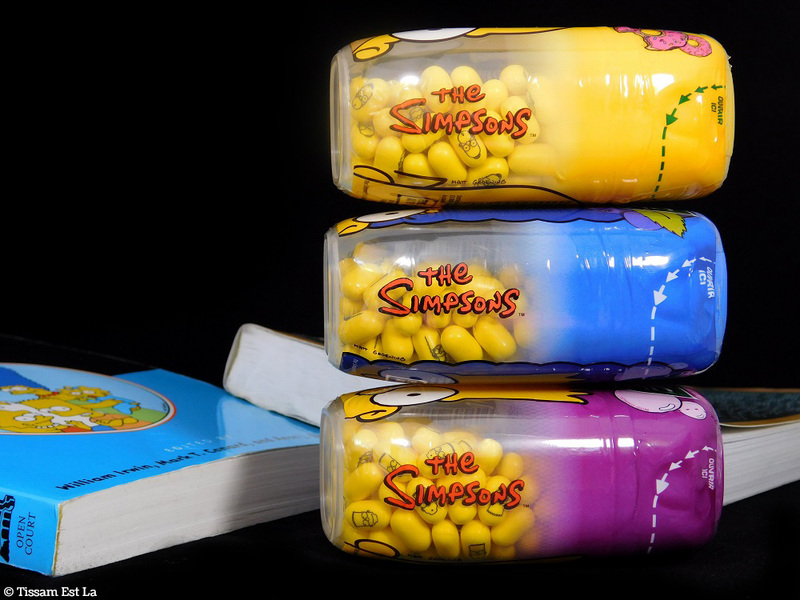 Trois goûts sont disponibles : Beignet pour Homer, Myrtille pour Marge et Bubble Gum pour Bart. La touche adorable, c'est la petite tête des persos imprimée sur une face des Tic Tac, avec deux expressions différentes selon les bonbons. 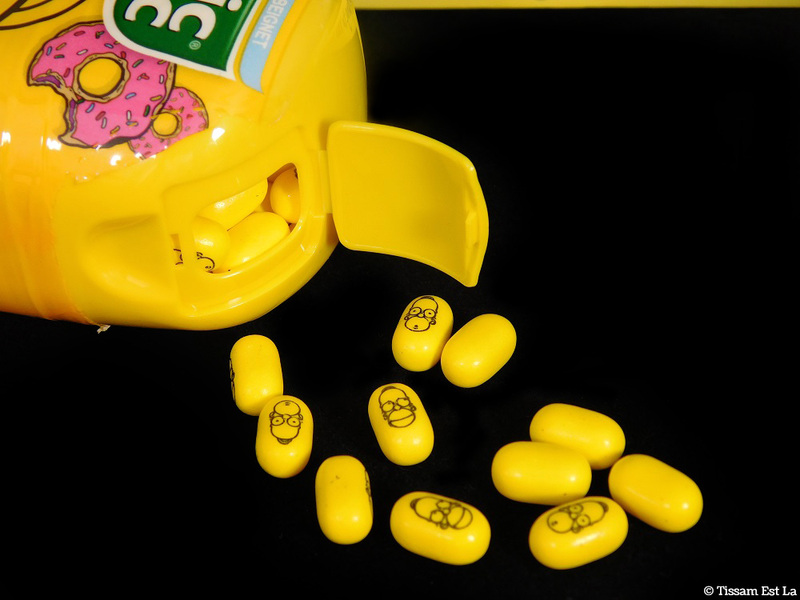 Pour ma part, j'ai adoré les bonbons au beignet qui me faisaient penser au goût d'un donut mais j'ai laissé de côté Bart et Marge qui, après leur goût de myrtille et de bubble gum, laissent un goût bizarre de fraîcheur made in Tic Tac, justement. A quand des Tic Tac Harry Potter, maintenant ? Est-ce que vous avez goûté cette version made in Springfield ? Qu'en avez-vous pensé ?